A FABULOUS EXPERIENCE FOR ALL! Wonderful memories were created when the Tallinn Music High School Youth Choir (Tallinna Muusikakeskkooli Noortekoor) visited Miami, Florida, from Friday, August 26, to Sunday, August 28, 2016. Arrangements for the choir’s visit to Miami (on their very first tour to the United States) were made by Jorge L. Viera, Honorary Consul of Estonia, Miami; and Lisa A. Mets, Honorary Consul of Estonia, St. Petersburg (FL). Waving Estonian flags and shouting “Teretulemast!” Anneliis Kuusik and Kaie Põhi Latterner of St. Petersburg; Viviana Paddrik of Ft. Lauderdale; and Priit Okas of Miami, who served as the choir’s Friday and Saturday host, greeted a smiling choir as the ladies approached the baggage claim area. Transportation whisked everyone away to their lovely accommodations at Hotel Urbano in the fashionable Brickell neighborhood of Miami. Once everyone was settled in their hotel rooms, Anneliis and Kaie personally delivered welcome bags that included Anneliis’s delicious home-baked cookies and a taste of Florida tangerines and chocolates and postcard souvenirs. Before shuteye following an exhausting day of travel, the still energetic choir visited their Brickell neighborhood shops and restaurants. Saturday’s activities, led by Ms. Nora Lemus and Priit Okas, took the choir on the Miami Metrorail to Dadeland Mall; after all, shopping is a must in Miami! The highlight of Saturday, though, was the choir’s evening concert at the architecturally beautiful First Presbyterian Church of Miami. Two key individuals at the church made this venue possible: Mr. Ryan Ellis, Music Director of First Presbyterian Church; and Martin Mola, Facilities Manager. We are grateful to the congregation of First Presbyterian Church for offering this exquisite site to the choir. More than 100 came to enjoy the choir’s concert. Special guests included members of Miami’s Consular Corps: the Consuls of the Bahamas, Macedonia, Peru and Argentina and the Honorary Consul of Estonia in Lima, Peru. Also mixed together in the audience were members of the First Presbyterian Church congregation, members of Florida’s Estonian communities (Kesk Florida Eesti Selts and Lõuna Florida Eesti Selts), and friends. The concert began with fabulous welcoming remarks by Kaie Põhi Latterner of St. Petersburg; those in the audience new to Estonia learned about our history, culture, our current celebration of the 25th anniversary of Estonia’s re-independence (August 20, 1991), and the importance of music all in just a few short minutes! The hour long program offered by the choir received words of praise such as these: “I’ve never heard such a beautiful choir until tonight!” “The young ladies sing like a chorus of angels.” “One can recognize that each girl gives her choir director 1000%” Our congratulations to Ms. Ingrid Kõrvits, choir director, and Ms. Jaanika Kuusik, choirmaster and vocal pedagogue, for guiding the choir to such great heights. Before the choir’s last song, Ms. Kõrvits and Ms. Kuusik presented the Estonian Honorary Consuls two beautiful gifts: a lovely book highlighting the history of the Tallinna Muusikakeskkool and a CD of the choir’s performances; and gifts of CDs and sini-must-valge magnets eesti mustriga to hosts Priit Okas, Anneliis Kuusik, Kaie Põhi Latterner and Viviana Paddrik. At the conclusion of the performance, following Estonian tradition, bouquets of flowers were presented to Ms. Kõrvits and Ms. Kuusik. A reception followed. First Presbyterian Church of Miami offered the choir a special opportunity: to sing in their 11:00 am Sunday worship service. The choir sang alone and together with the First Presbyterian Church choir. One hymn was sung together in seven different languages! Mr. Ryan Ellis, Music Director of First Presbyterian Church, offered words of welcome to the choir and a warm introduction of Estonia to the members of the congregation. With just a few hours left before departure to the airport, Estonian Honorary Consul Jorge Viera led the choir on a special excursion by trolley to the hip Bayside Marketplace. There the young ladies mixed and mingled in song and salsa with other friendly visitors to the area. After a pause for ice cream it was time to return to the hotel to catch their shuttles to the airport. Everyone should be as lucky as Mr. Viera: The choir serenaded Mr. Viera as their parting gift! About the Choir. Tallinn Music High School (TMHS) is unique both in Estonia and Europe. From 1st to 12th grade pupils learn both regular academic subjects and music. There are about 300 students at the school, who all learn an instrument, singing, conducting, and music theory or composition as a specialty. The purpose of TMHS is to raise future professional musicians who will continue their studies in the Estonian Academy of Music and Theatre or in a foreign music college. Girls aged 14-19 sing in the youth choir. The choir is very active with concerts and interesting side projects with professional musicians, choirs and orchestras, e.g., the Estonian National Symphony Orchestra, Estonian Philharmonic Chamber Choir, Estonian National Male Choir, among others. The choir and its director have won several awards in international festivals and competitions. An interview with choral director Ingrid Kõrvits, published in Vaba Eesti Sõna, can be found here: July 31, 2016 interview with Ingrid Kõrvits. About the Concert Program. The choir’s music programme contains very different pieces of music, from Estonian folk song arrangements to American gospel arrangements. 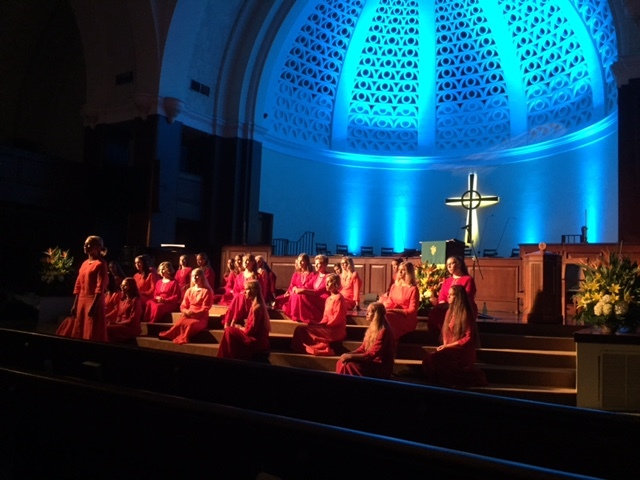 On its American tour, the choir performed music from Finnish and Swedish composers. The choir has chosen pieces that would speak to the audience and offer an exciting listening and visual experience (several songs are choreographed). Audiences were delighted with the choir’s diverse selections! The Choir’s Tour to the United States (Aug. 18-20 and Aug. 26-27) and the Bahamas (Aug. 21-25). The choir’s travels have taken them to Germany, Spain, Austria, England, Hungary, Cyprus, Greece, and Italy. This year the choir participated in America Cantat VIII in the Bahamas from August 21 to 25, 2016. Bookending the festival, the choir conducted its first tour to the United States. Three performances were scheduled from August 18 to August 20, 2016 and two performances were scheduled in Miami August 26 to 27, 2016. The choir also performed informally in the Maryland State House and in a children’s hospital in Washington DC.